Allahabad Bank customers can now request Cheque Book online through net banking, mobile banking and by sending an SMS. To get new Cheque Book normally person have to visit the bank, but if you have Allahabad Internet Banking or mobile banking facility then you don’t need to visit ban, you can order new Cheque book online. Allahabad Bank is nationalized public sector bank and has over 2,500 branches across India. You can open your saving account here with just 1000 initial deposit. Here we will tell you 3 methods to apply new Cheque Book without visiting branch. 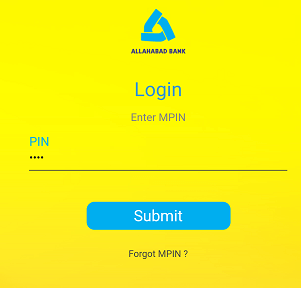 Allahabad Bank net banking allows you to manage and access your account online. Many online services available on net baking so you don’t need to visit the bank for all services. 2: After login, Click on Account Services and then click on Cheque Services. 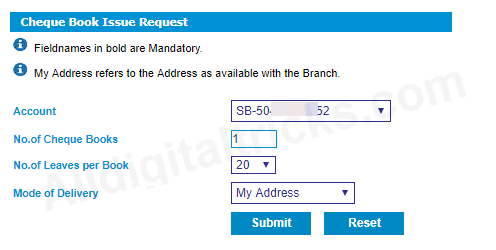 In Cheque Services, you can see Cheque Book Request option, click on it. 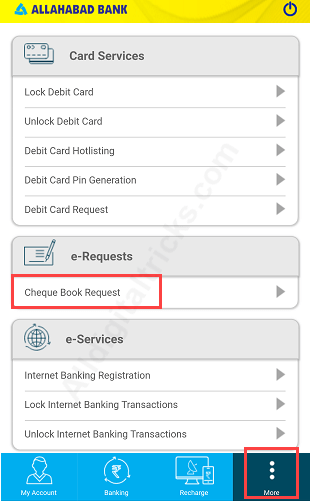 3: On next page select Account number, enter the number of Cheque book (e.g. 1), Enter the number of leaves (e.g. 20,30) & Mode of delivery Select “My Address, now submit your request. 4: Next screen confirm your request, enter transaction password and submit. That’s it your request submitted successfully. You can activate Allahabad Mobile Banking online and avail many banking services on your phone. 1: Login to mobile banking by entering MPIN. 2: After login, tap on More. Here you can see e-Requests option. Tap on Cheque Book Request. 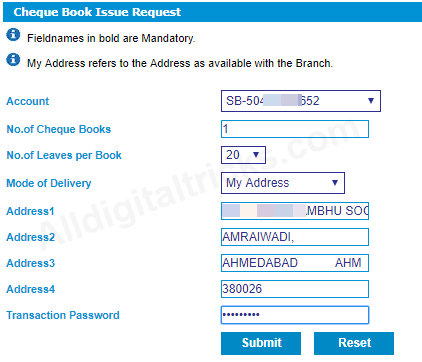 3: Now select the number of Cheque books and number of leaves and submit your request. 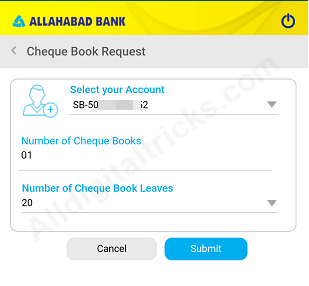 If you are registered with Allahabad Bank SMS banking services then you just need to send an SMS from your registered mobile number to request new Cheque book. 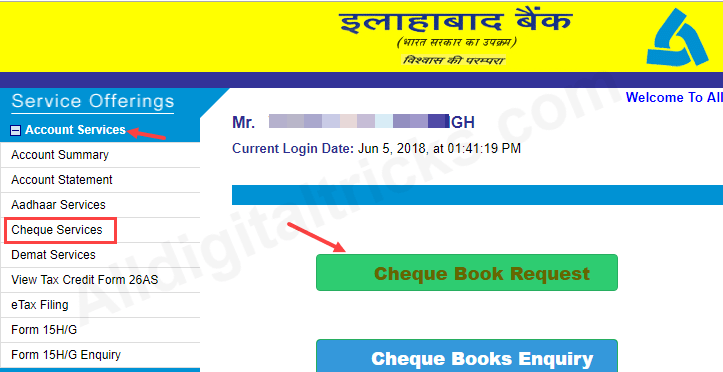 So this is how, by following these 3 methods Allahabad Bank customers can request new cheque book online, no need to visit Bank.